Floating Solar: A Solution for China? Water has a unique propensity to never stay in one place for very long. Evaporation is one of its favourite ways to escape. Although the evaporated water ultimately falls again as rain or snow, it can be considered as a water loss for the surrounding environment. What if we could reduce this loss? And what if we could produce electricity at the same time? Floating solar panels aim to do that, and more. Given China’s need for more power and its scarce water resources, is it a matter of time before the country embraces floating solar? The principle of floating solar panels is rather simple: instead of installing solar PV modules on land, they can be fixed to a floating structure on a water body. This change alone can bring many benefits, including the reduction of “water loss” from evaporation, higher panels’ efficiency, saving of arable land, as well as limit algae growth. A few studies have tried to estimate the amount of water evaporated from reservoirs globally. 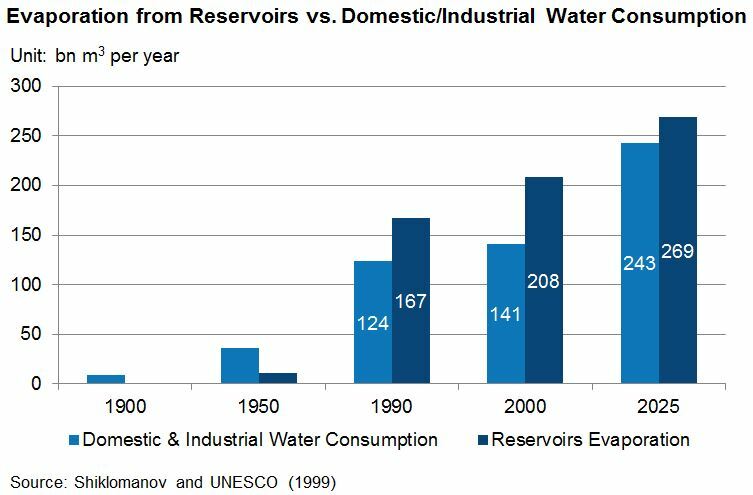 The study most commonly referred to estimated that the “water loss” reached almost 170 billion m3 in 1990, around 7% of total water use at the time. According to the same study, this is even greater than the consumptive use of water by industry and households – see chart below. Rough estimations in China suggest that evaporation loss from reservoirs in Northern China could reach 20 billion m3, equivalent to a third of the annual flow of the Yellow River. By covering reservoirs with structures, one can reduce evaporation and thereby water loss for downstream users. See for instance how California is adopting shade balls to achieve this. Floating solar can reap these benefits too. Solar panels efficiency tends to decrease when the cells’ temperature increases. The natural cooling effect provided by water could improve the installation performance by more than 10% compared to its grounded counterpart. China is short not only of water resources but also of arable land. Whilst China accounts nearly for 20% of the global population, it holds less than 8% of world’s arable land. For food security reasons, the Chinese government set out an arable land “red line”: a minimum of 120 million hectares. According to the Ministry of Land & Resources, cultivated land was 135.2 million hectares in 2013 but soil pollution, urban sprawl and soil erosion put downward pressure on this figure. Accordingly, the ministry set some requirements on land use, including for solar panels as detailed in the December 2015 ‘Standard on Monitoring Land Use for Construction Projects of Photovoltaic Power Stations‘. While centralized PV power plants have to meet some land use efficiency targets, floating solar panels are exempt since they do not require any additional area. Several countries keen to become early adopters… what about China? With the various advantageous features, floating solar solutions have been gaining attention recently. Technological progress, cost reduction, evolving political environment and growing tension around water issues, all of these factors strengthen the case for floating solar. 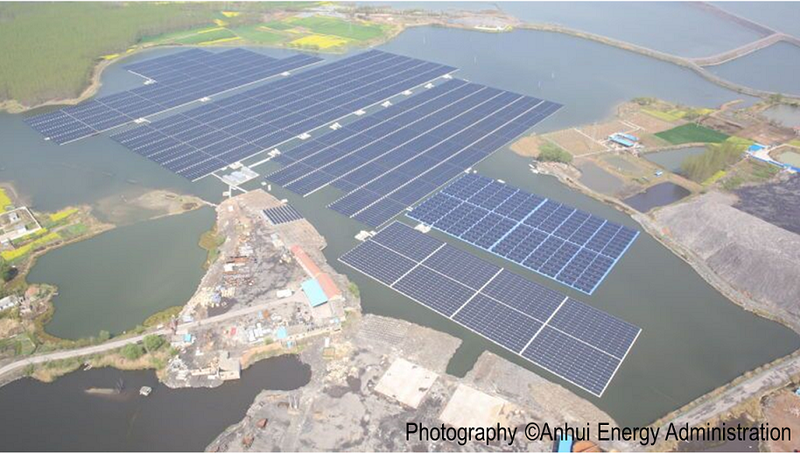 The first large-scale floating solar projects (>10MW) started in 2015. Brazil announced a 350MW project in the Amazon. India, the US, Japan and the UK are also giving it a try. 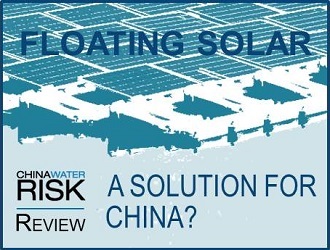 There are no official or consistent statistics on floating solar installations in China. However, a look at local government announcements and the news sheds some light. Between 2013 and 2015, the number of initiated projects per year declined; by 2015 planned/under construction & already operational floating solar projects accounted for only around 100MW. However, in 2016 there was a reverse in this trend with a steep increase to around 1,300MW. Clearly, 2016 could be a landmark year for floating solar in China, with already 1.3GW worth of projects in the first four months only – either approved, under construction or newly operating. For comparison, China added around 18GW of solar power capacity in 2015. Anhui province plans to add 3.2GW of floating solar in the next two years on subsided land areas created by abandoned coal mines. However, a closer look reveals that many of China’s projects are not literally floating panels. Some of them rather have solar panels set above shallow fisheries on fixed structures, as shown in the pictures below. Though technically not floating these projects also reap the same benefits. Combined fisheries and solar panels may explain why Jiangsu Province has the most “floating panels” with already 1GW installed. Jiangsu and Hubei have the largest additional capacity in the pipeline: these two regions are respectively the third and first fishery provinces in China. 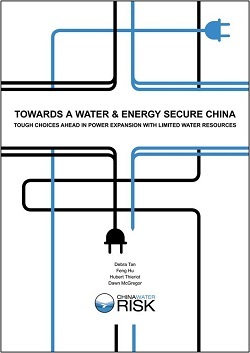 Fisheries are not the only option for China to develop its solar industry without using its precious & limited land, reservoirs are an option too. Chinese official statistics mention a total of 97,721 water reservoirs in the country. The number of large dams is vast as well: according to the International Commission on Large Dams, China holds more than 40% of the world’s large dams with around 24,000 units. Indeed, China has been an insatiable builder of dams and reservoirs during the last decades, mostly in a bid to fight floods and resist droughts. The road is all mapped out, let’s drive it! 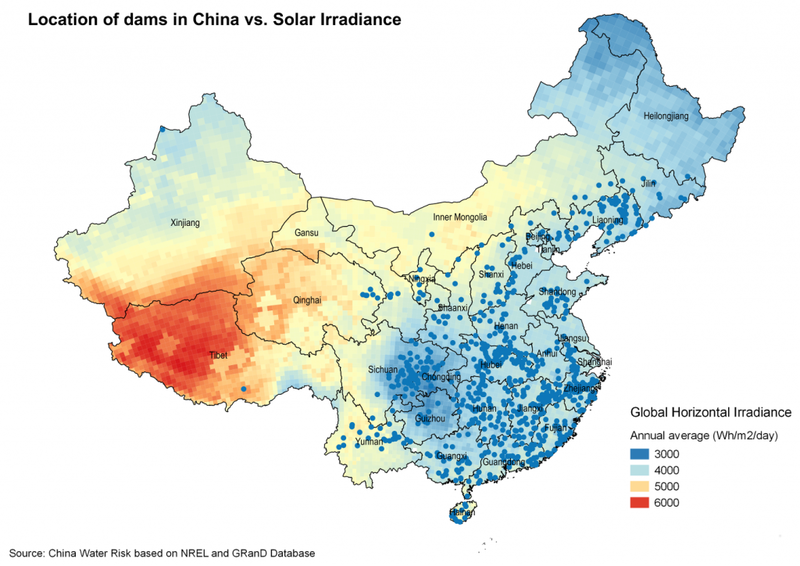 Floating solar aligns with recent Chinese strategies, including the ‘Strictest Management of Water Resources‘, the ‘Promotion of Land Saving and Intensive Use‘ and the ‘Development of Advanced Power Equipment Manufacturing‘. Moreover, China’s commitment to source around 20% of its primary energy from non-fossil fuels by 2030 means that it needs 800GW to 1,000GW of additional renewable energy capacity by then. Floating solar could help reach this target. However, more pilots need to be undertaken to assess the pros and cons of the technology. Impacts on local ecosystems for instance need to be better understood and certainly not every lake, fishery and/or reservoir should be covered with solar panels. 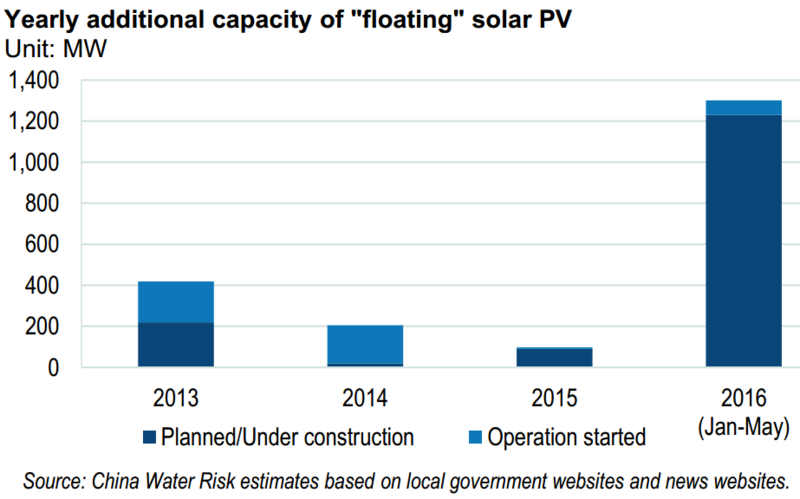 It would be surprising however not to see more floating solar in China in the future.